In May 1919 Leigh Parish Council called a meeting in the village to discuss what should be done to commemorate those from Leigh who had been killed in the First World War. There was at the time a nationwide project to create such memorials which was in effect a huge communal arts project, resulting in buildings, parks, hospitals, cenotaphs, statues, plaques, to name but a few of the ideas. 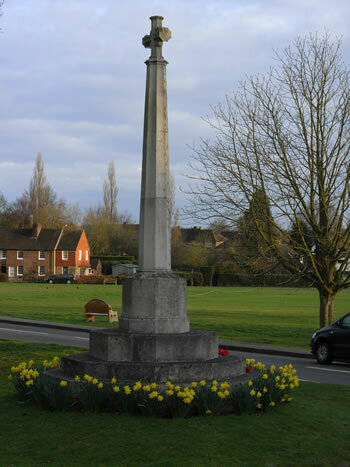 In Leigh, a war memorial committee was formed, chaired by Mr D W Gordon, with Mr Boby as secretary, and Mrs Harold (Helen) Cox as the treasurer. An appeal for funds was launched and between August 1919 and March 1921 £466 was raised by donations. (This sum is probably the equivalent of £3,000 today). The donations ranged from 1/-, 2/6d, £5 or £10 and often people gave on several occasions. The chairman and his wife gave £75. Even the architect, Mr Arthur Cooksey FRIBA, gave 10 guineas. Mr Cooksey’s detailed drawings are today still with the Parish Council records. After the plans were agreed, two wooden models were made (they cost £22) by Messrs Pannett & Sons. Then Burslems of Tunbridge Wells constructed the now familiar cross, mounted on an octagonal pillar of Portland stone and the thirty-one names of Leigh’s fallen were inscribed on it. It was set on a four foot concrete base on the side of the Green, a site given by Lord Hollenden. It was formally dedicated on 12 November 1920 and The Times had a picture of it. (It appears in We Had Everything …). From the Treasurer’s accounts, the total cost was £477-2-9d, of which the memorial cost £429-8-2d, a bugler for the ceremony 5/-, the printed service forms £4-11-6d and invitation cards £1-3-6d. In 1922, after lengthy negotiations between the committee and the Ministry of Health, responsibility for the care and upkeep of the memorial was handed over to the Parish Council who still regularly maintain the stonework. Originally there were posts and chains round the Memorial but, in 1940/1 as part of the war effort, the chains were removed, as were those round the cricket square, and in 1946 it was agreed to remove the posts as well. On 13 November 1947, Charlie Ingram proposed at a Parish Council meeting that the British Legion should be consulted about how to honour the dead of the Second World War. It was agreed to have further inscriptions added, with the eleven names of those who had given their lives and the second quotation. The work was again carried out by Burslems in 1948 with the lettering painted with gold size. In addition, four oak seats with carved backs were commissioned from the British Legion Workshops near Maidstone, although these had to be replaced long ago.